Thank you all for being our angels during this difficult time. Thank you for your kind words of encouragement and all of your prayers. We are humbled and grateful. 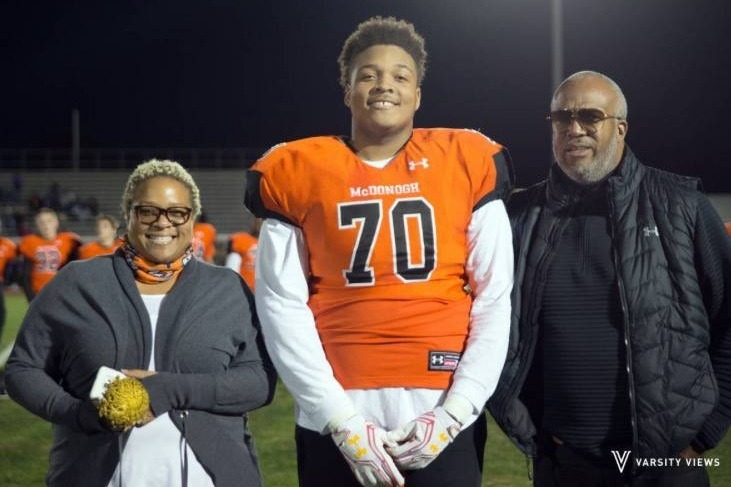 Our family has created "The Jordan McNair Foundation " as a non-profit organization to promote awareness, educate and advocate for parents and student athletes about heat related illness at the youth, high school and collegiate levels. To learn more about the foundation, visit https://thejordanmcnairfoundation.org/. After meeting him, you quickly realize that Jordan McNair is an exceptional son, friend, teammate and human being. Last week, Jordan was airlifted to R Adams Cowley Shock Trauma Center in Baltimore, Maryland. Without disclosing all of the details of Jordan’s medical condition, he received a liver transplant and has been fighting for his life for the past week – and will continue to do so over the next several months. When friends inquired how they could help, Tonya and Marty asked only for prayers. Many of us have witnessed Tonya and Marty’s strength and faith during this experience. This is something no parent should ever have to bear. We are Jordan’s football family and want to help Tonya and Marty carry some of that heavy load. Jordan’s recovery will be long. He will be in the hospital for several months and his parents deserve to be at his side throughout his recovery. As his football family, we would like to provide Tonya and Marty financial relief so that they can remain focused on Jordan’s recovery. Our goal is $20,000. Every donation, no matter how big or small, is appreciated. Our family has created "The Jordan McNair Foundation" as a non-profit organization to promote awareness, educate and advocate for parents and student athletes about heat related illness at the youth, high school and collegiate levels. The community support for Jordan and his family is heartwarming. Thank you for helping Jordan's family remain by his side without worrying about the "small stuff". Most of all, let's keep Jordan and his family in our prayers through his recovery. Wow! It's been less than 24 hours since we officially launched Jordan McNair's family support fund. The support we're seeing is overwhelming! So far we have raised $9,290 to help the family remain by Jordan's side throughout his recovery. We're half-way to our goal! But the other support we've witnessed is people sharing our page and promoting it within their communities. The genuine concern for Jordan is beautiful and I'm sure it means so much to the family that he is being kept in your prayers. We just wanted to share an update and thank you for your generosity.